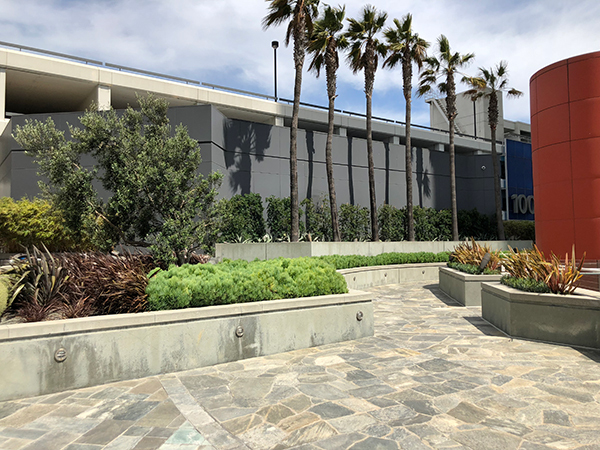 Originally a strawberry patch, Pacific Corporate Towers (PCT) is a Class A commercial office space, located between the Los Angeles International Airport and the Pacific Ocean. The LEED Gold property is home to more than 90 tenants. LandCare has maintained the site since November 2009. It secured the deal after PCT’s chief engineer spotted the work LandCare had accomplished on a neighboring property. 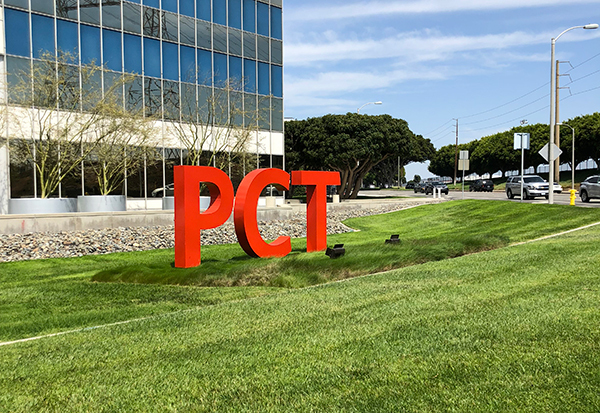 PCT wished to uphold its LEED Gold Certification, while still providing an urban oasis for its tenants to relax and engage in recreational activities — no easy task with the drought that’s plagued California since 2012. The LandCare team also had to find organic methods for pest and fungus control and learn how to maintain different types of landscapes all in one location. LandCare achieved the upkeep of the property’s planters, lawns, no-mow areas, gardens, walkways and bridges using Exmark mowers and smaller equipment from Echo. 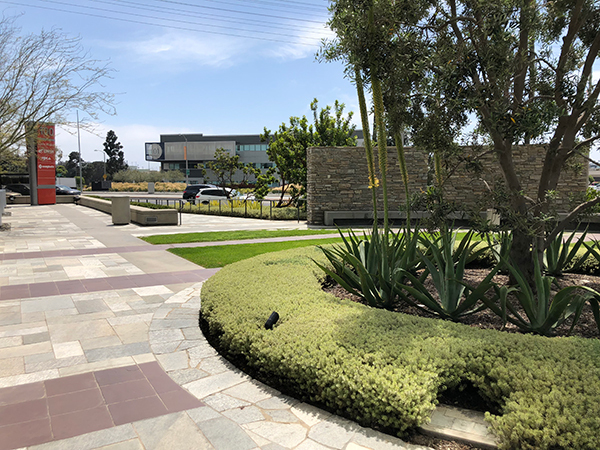 To contend with the dry conditions, LandCare incorporated Weathermatic’s smart irrigation controllers, installed drought-tolerant plant materials and performed regular assessments of the property’s water needs. Thanks to LandCare’s team, PCT tenants continue to enjoy the benefits of a sustainable outdoor living space. The project earned LandCare a Gold Award from the National Association of Landscape Professionals’ Awards of Excellence program. Pacific Corporate Towers is a cluster of Class A commercial office buildings in El Segundo, Calif. It has been LEED Gold certified since 2015, adding another level of complexity to the maintenance of the grounds. The property prides itself in having created an urban oasis that emphasizes healthy and vibrant living. From its curbside to the inner sections of the complex, PCT fosters a love for the outdoors with its environment. PCT grounds promote an active lifestyle. Grass is vibrant and lush, hedges are trimmed evenly at least once a month and bamboo trees in planters are well maintained. The leaves are swept daily, and the hedges cannot exceed an established maximum height. The landscape emphasizes healthy living, welcoming tenants to take a stroll or join a pickup game of basketball. 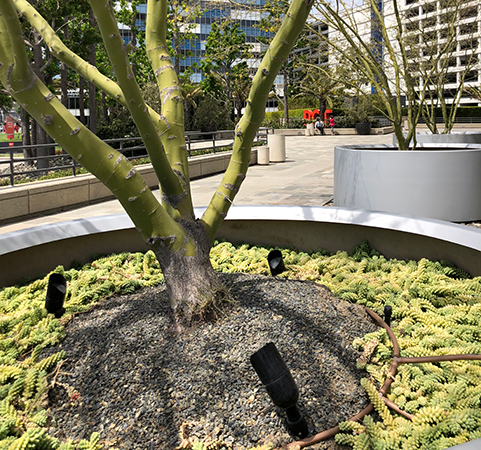 Large planters are strategically placed around the grounds with ornate Desert Museum trees. As a LEED certified property, these trees are treated with horticultural oil instead of pesticides. 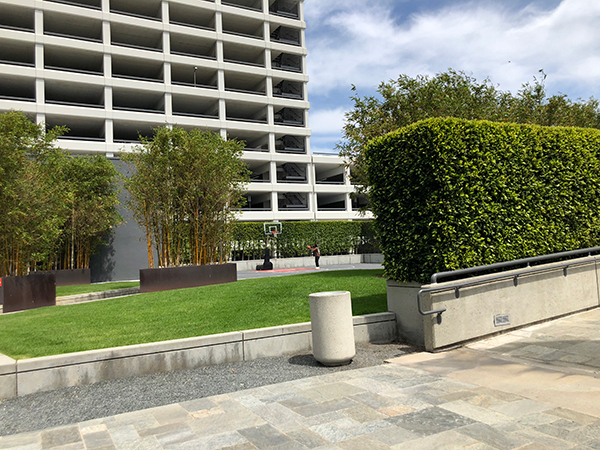 A walking path from the main building leads to a mini park, a welcome reprieve from the urban setting of El Segundo. 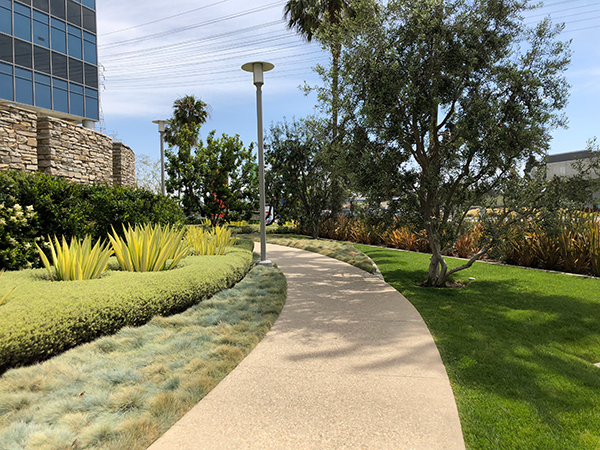 Tenants can take a light stroll while admiring the drought-resistant plant life beautifully arranged on raised steps alongside the building, or they can continue along the walking path to enjoy the lush green grass and shade of the trees. Along the stone walkway, a well-manicured lawn sits on one side while various drought-resistant plants align the other. Furcraea plants pop out of westringia shrubs with blue festuca borders for an aesthetically satisfying design. PCT proudly supports several areas around its property that promote outdoor recreation and enjoyment. This section has benches and additional seating for tenants to briefly escape the office and enjoy the environment. The courtyard was designed for tenants to be able to sit and take pleasure in meals, conversations or any other outdoor activities. Fox tail agave surrounding red perennials are maintained in red beds around the perimeter of the courtyard. Again, PCT artfully creates areas that promote outdoor enjoyment. 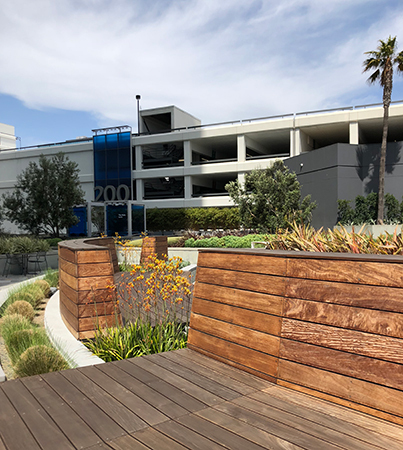 Wood benches surrounded by creatively arranged drought-resistant plant life like kangaroo paws, red Mexican feather grass and variegated dianella provide a great backdrop for outdoor conversations. 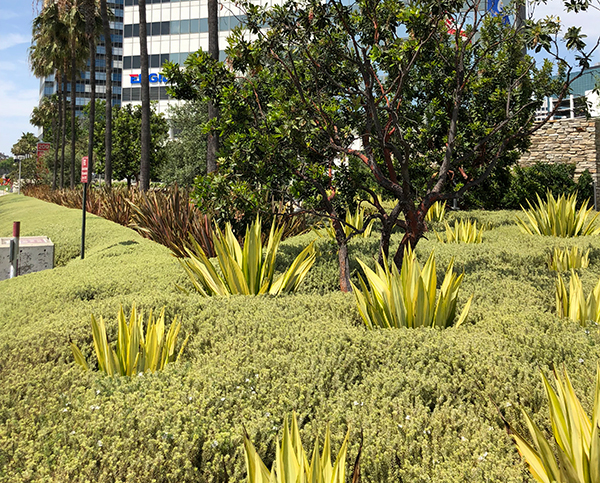 Trees, hedges and succulents all grow adjacent to this side of the PCT complex and must be maintained behind the curb to promote the health of the plant materials individually and holistically. Podocarpus trees are trimmed evenly across, and walkways are frequently swept for leaves. 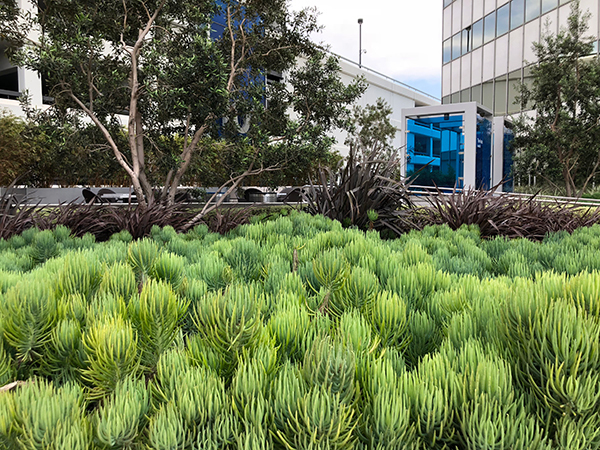 The plants around the property were selected for their drought tolerance, their contrast in colors and their distinctive look and shape. Variegated flax align the back, followed by westrengia in the middle and red flax in the front, surrounding the lone olive tree. 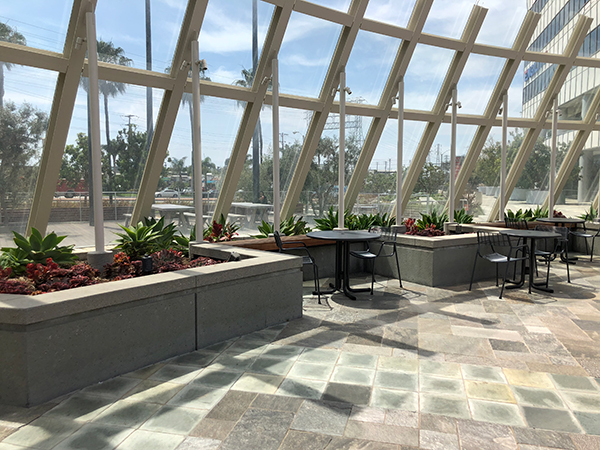 Again, all plant materials are treated and maintained organically, following strict LEED guidelines. 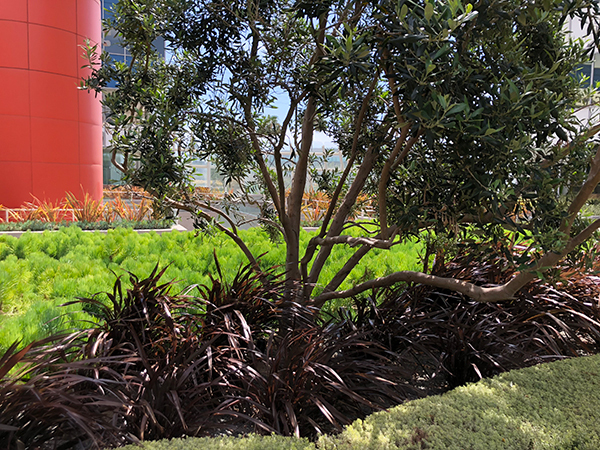 Every section of the complex is accented with lush but water-wise plant selections that uphold a sense of vitality and health. 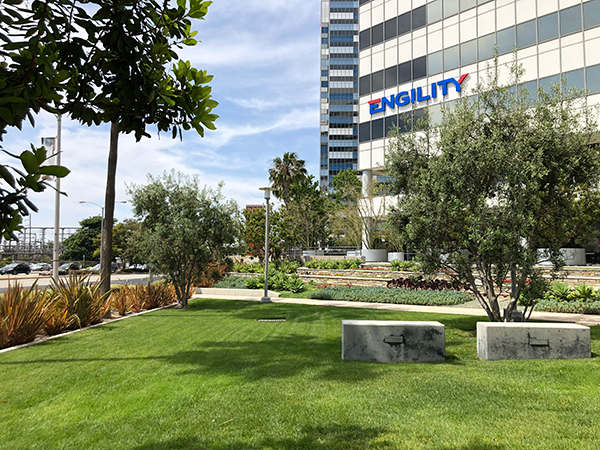 Maintaining a healthy curbside lawn in hot Southern California during a drought is challenging. The team works tirelessly to address heat spots, pests and damage resulting from foot and pet traffic.